40 time more than spinach), high volumes of gammaLinolein acid Further, Spirulina contain Phycocyanin which can only be found in Spirulina. 1.The factory Loceted in Inner Mongolia,where the best place to breed spirulina. 2.Using underground 400 meter water ,No pollution and Addition. There are four major conditions for growing Spirulina. A number of animal and test tube studies suggest that spirulina increases production of antibodies, infectionfighting proteins, and other cells that improve immunity and help ward off infection and chronic illnesses, such as cancer.However, it has not been tested in people. In one clinical trial that involved humans, another type of bluegreen algae called chlorella did not boost the immune response to flu vaccine. protein,such as nuts, legumes, whole grains, and meat, provide protein in smaller servings. Animal and test tube studies suggest that spirulina may protect against allergic reactions by stopping the release of histamines, substances that contribute to allergy symptoms, such as a runny nose, watery eyes, hives, and soft-tissueswelling. Although antibiotics destroy unwanted organisms in the body,they may also kill"good" bacteriacall probiotics,such as Lactobacillus acidophilus.This can cause diarrhea.In test tubes,spirulina has boosted the growth of L.acidophilus and other probiotics.More research is needed to determine whether spirulina will have the same effect in people. In one placebocontrolled study, taking spirulina seemed to reduce a precancerous lesion known as leukoplasia in people who chewed tobacco.Lesions were more likely to go away in the spirulina group than in the placebo group. More research in this area is needed. Preliminary evidence suggests that spirulina may help protect against liver damage and cirrhosis (liver failure) in people with chronic hepatitis. Without more research, however, it is impossible to say whether spirulina offers any realbenefit. 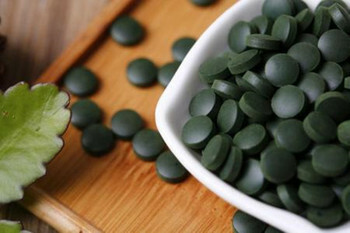 Spirulina contains a high concentration of zeaxantuin,an important nutrient linked to eye health. As such,spirulina may help reduce the risk of cataracts andage-related macular degeneration. More research is needed.